Vegan Welcome is a project by VeggieHotels, the first hotel cooperation for purely vegetarian and vegan hotels, Bed & Breakfasts, seminar- and health centers. 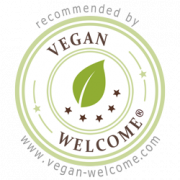 The aim of VeganWelcome is to provide all travelers, who attach great importance to a vegan nutrition, an even greater range of accomodation with a reliable vegan offer. First of all we would like to make it more easy to find suitable accomodation if you follow a vegan lifestyle and provide thus a vegan orientation in the vast area of travel choices. Fortunately, an increasing number of private hoteliers and hotel companies starts to address seriously the vegan lifestyle and adapt to the demands and needs of a new, growing circle of guests.